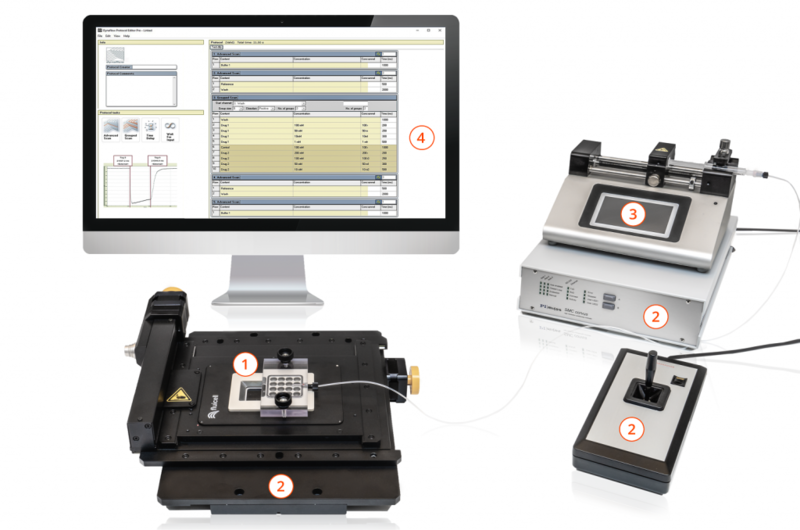 The Dynaflow® Resolve is an ion channel screening platform for your existing patch-clamp setup that offers solution exchange at unsurpassed speed, control, and flexibility. The system allows for recording of any ion channel current in any patch-clamp recording configuration. You can use all type of cells and all kinds of compounds that are required for your successful experiments. 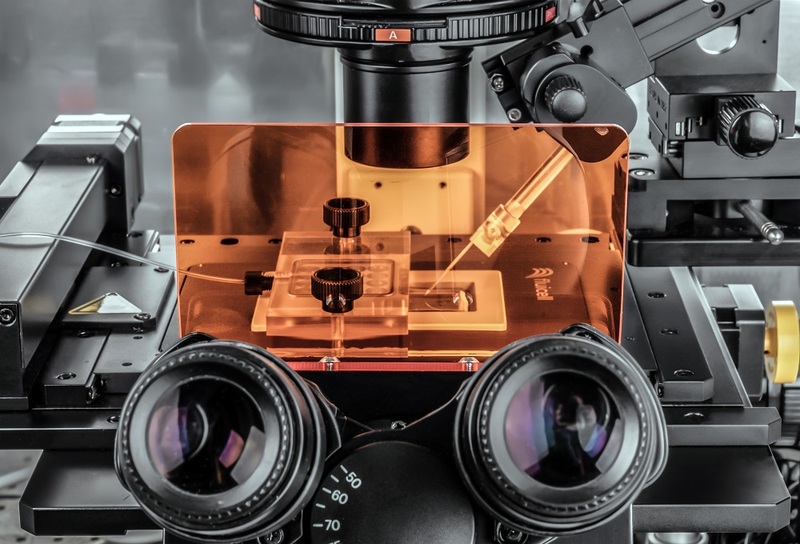 Works with any cell type, any patch-clamp configuration, and any type of ion channel from single-cell channel recordings to secondary ion channel screening. Rapid solution exchange (low millisecond range) enables analysis of fast kinetics. Allows long experiments with less than 150 μl, minimizing compound and buffer consumption. Enables long experiments and long exposure times. Optimized for sticky compounds and designed for cumulative dose-response. Numerous cells per chip. Multiple compounds analyses per chip. Full dose-response for every compound. Gigaseal recordings with superior experimental control. 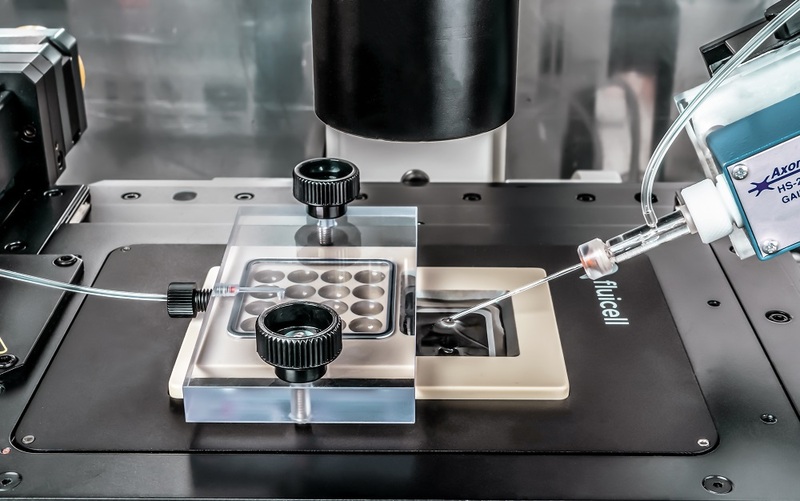 The system includes a motorized scan stage with stage controller and a joystick, a syringe pump to drive the flow in the microfluidic chip, as well as the Dynaflow® Commander software. It fully integrates with most inverted microscopes. The Dynaflow® Resolve chip has 16 microchannels and is composed of a glass microfluidic chip and a plastic interface forming the wells and the recording chamber. The chip is reusable and developed to reduce the risk for non-specific binding of “sticky compounds” and offering improved cost-efficiency through low compound consumption. A motorized scan stage is used to automatically translate chip movements. It includes a stage controller and a joystick and it is controlled by the Dynaflow® Commander software. A easy setup syringe pump especially designed to drive the flow in the Dynaflow® Resolve chip. The Commander software assures control and pre-programming of the movements of the scan stage. It synchronizes precision solution exchange with real time tagging of the acquired data. The Windows-based Dynaflow® Commander software allows a full control of experiments, including scan protocols, exposure times and instant protocol changes. “We bought the Dynaflow Resolve system because we needed a manual patch clamp system with reliable and fast solution application. 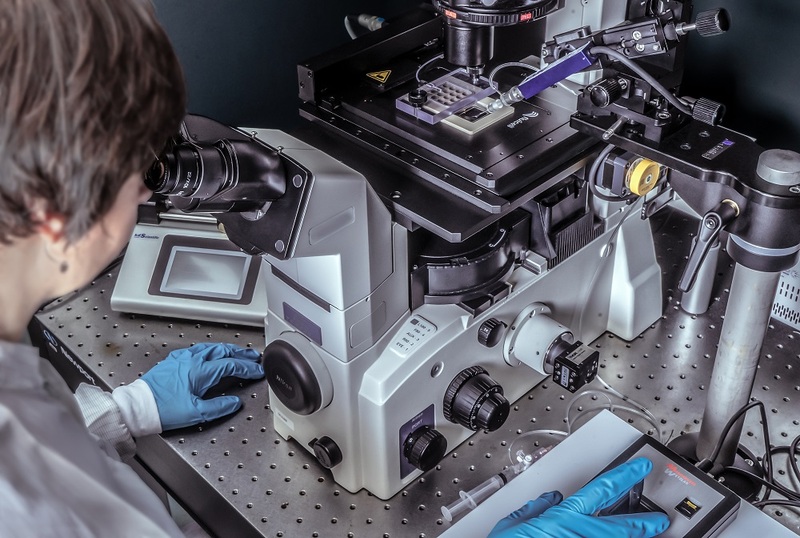 Yes, the Dynaflow® Resolve technology fully integrates with conventional patch clamp set-ups and with most inverted microscopes. Fluicell provides everything needed to run the Dynaflow® Resolve platform. Can the system be used in an up-right microscope? No, this type of chip will not work with an up-right microscope. Can the system be used with any objective? No, the base of Dynaflow® Resolve chip is made of 0.7 mm thick glass requiring the use of a long working distance air objective. Are the channels filled automatically? No, but the chip is very easy to fill with a manually operated syringe. How long time does it take from filling the chip to performing the first scanning experiment? About 10 minutes, depending on how fast you perform the patch clamp procedure. The lid is used directly to connect pressure source to all the channels. The plastic lid can easily be opened and resealed to the chip using two nuts and a rubber ring sealing. When the lid is attached, it encloses a common volume of air over all substance wells. By pressurizing this air through the lid, the flow is driven from each well and out into the recording chamber. Additionally the lid functions as a protective barrier, shielding both the user and the solutions. 3 kPa positive pressure is needed when using standard settings. More details can be found in the Thesis “On Microfluidics in Biotechnology: New Devices and Applications” (Johan Pihl), p. 18-19. The substance reservoirs hold 150 µl. This is sufficient for 90 min flow time with a flow-rate of 26 µl/min. The flow rate is set to be approximatively 4 mm/s at the channel outlets. What materials are used in the chip? The chip is composed of a glass microfluidic component and a plastic interface (PEEK) forming the wells and the recording chamber. The plastic interface has been treated with titanium first, then with silicon oxide to allow for even wetting. The bottom of the chip is made of hard anodised aluminium. The lid is made from polycarbonate, O rings and seals from Viton and tubing in Teflon. We are using material that is standard for biological applications. Using a glass chip has several advantages such as reusability, reducing risk for non-specific binding of “sticky compounds” and non-absorption of highly hydrophobic compounds. Is the Dynaflow® Resolve chip reusable? Yes, The Dynaflow® Resolve chip is reusable meaning that the chip is emptied and washed properly after every use. The Dynaflow® Resolve chip needs to be washed after every use to remove any traces of components such as cell debris, particles, potential salt crystals, all of which can contaminate or block channels. Overtime, regular cleanings are not sufficient to remove all traces of components within the chip and an annual refurbishment is necessary to maintain the chip. This is not a problem when the cell is in the collimated flow zones, where only the substance that flows out of the channel is present. But, the cells present in the recording chamber will be affected by the compounds which flow out. If the flow has been running during a whole scan it is advisable to add new fresh cells. Additionally, the chamber should be rinsed thoroughly before applying new cells. Concentration response curves, (EC50, IC50), receptor kinetics, receptor activation, thermodynamics of ligand binding. Dynaflow® Resolve is used for target identification and validation, lead identification and optimization and preclinical assays. Is it possible to screen substances with or without re-sensitisation of receptor responses? Yes, it is possible to screen substances with or without re-sensitisation of receptor responses. How many substances can be screened per day with the platforms available today? The number of substances one can screen per day with the Dynaflow® Resolve system depends very much on the character of experiments. As the chip is reusable, many assays can be performed per day. How is the cell affected by repeated substance stimuli? – The time the cell spends in the exposure zone. Screening desensitising receptor systems for several different substances, is that ok? By adding agonist free buffer in every other channel of the chip, an intermittent wash out between each agonist is established. The scan stage is easily programmed so that the time the cell spends in the rinsing buffer would be sufficient for reactivation of the ion channel receptors. Which ion channels can be used with the Dynaflow® Resolve system? Both voltage and ligand gated ion channels, the system is very flexible. Experimental control is an important issue. With the Dynaflow® resolve system, you always know the true molecular composition of the bioactive substances around the patch-clamped cell, as well as the exposure time and switching speed. The cell should fit with in the diffusion zones of the collimated flow, and the size and shape of the cell determines the forces acting on the cell by the flow. Apart from this, as long as a cell can be patch clamped and lifted, it can be employed together with the Dynaflow® Resolve system. With the present system, the cells need to be dislodged from the surface if they are adherent. We recommend a few different methods for use such as; treatment with Ca2+ free buffers, trypsin or simple mechanical dissociation. It is OK as long as the user feels comfortable with it. An internal control substance should always be used. How long is a patch clamped cell stable in the flow? 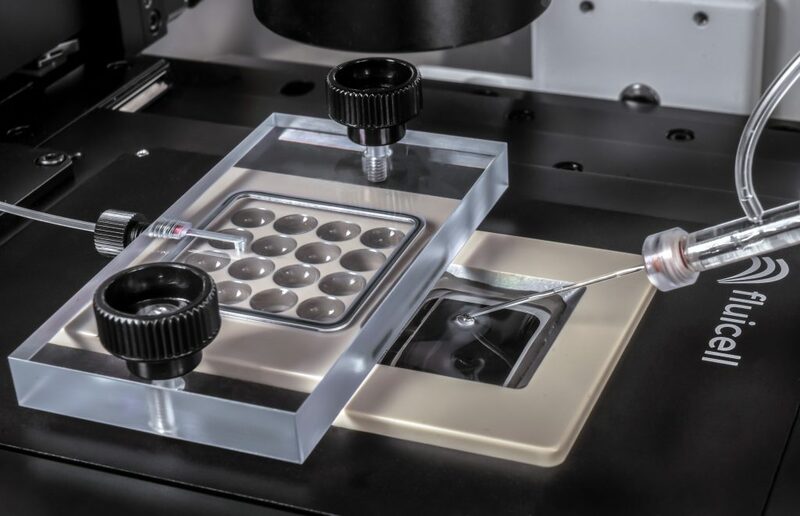 In our experiments, we have seen an effect of more stable seals and higher resistances when the cell is in the flow, due to the flow field pushing the cell against the tip, indicating that the seal becomes better using Dynaflow® Resolve System. Experiments have been performed for over 20 minutes. Data suggests that the seal becomes stabilized by the flow which means increased stability in the measurements. However, viscous drag could become apparent at high acceleration of lateral movement. This does not differ from conventional patch clamp and depends to a large extent on which ion channel systems are studied. Some ion channels are reconstituted in membrane without loss of function. Others need an “intracellular cocktail” in the buffer to function properly.